If you ever wondered “Why” DT4EMS exists, this is my story. 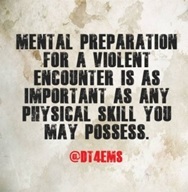 For years I would work with EMS partners who knew I was a martial artist and a police officer. I would be asked about techniques. They would ask, “Hey, how would you get out of this hold or stop this type of attack?" I would show them an escape technique or a skill to evade a specific attack. Then after a while it dawned on me; I need to show more than just the technique; how to not be there in the first place. Hence the first DT4EMS class was formed in 1996 and taught for CEUs in 1997. I really created it simply as a hobby. I created it as a way to give structure to the way the information was presented. Little did I know my hobby would become a passion one morning working on a rural ambulance. It was a cool fall morning. The sun had not come up yet. My partner and I were dispatched to a report of a patient who had a “pacemaker that is failing”. We arrived on scene, treated the patient and began our transport to a hospital that was about 40 miles away in Jefferson City. The patient was in her late 70’s and her daughter, who was in her 40’s, accompanied us (she rode in the front passenger seat). En route, dispatch advised us of a “body in a ditch” and asked if we could check on it. In a very rural setting, requesting a unit already transporting a stable patient to check on an emergent (like coming up on an MVC) was not all that uncommon at the time. My patient was stable and I advised my partner he could stop and check on the “body” and relay the findings back to dispatch. I recall sitting on the bench seat and looking up and through the windshield as I felt the ambulance slow down and make the U-turn. I could see a man wearing a white t-shirt and blue jeans, prone on the grass near the road. After my partner completed the U-turn he pulled onto what little shoulder there was. We were now facing south on the northbound shoulder of US63. I began to apologize to my patient and her daughter for the delay and explained we would be moving again shortly. Suddenly the back door of the ambulance opened. My partner was standing there with the guy from the ditch. Immediately I could smell a strong odor of an intoxicating beverage fill the back of the ambulance. 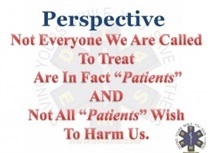 Rather than allowing the “subject” to get into the back of the ambulance. I told my partner to have the guy sit on the bumper and to “call him a ride”. I said it in a tone hoping to signal my partner to call the police. My immediate thought was the guy had no need for an ambulance. He was awake, ambulatory and had obviously been consuming adult beverages. I knew that DRUNK IS NOT SICK. The back door shut and what seemed like only seconds passed when I heard the door chime. I then watched in disbelief as an arm, not belonging to my partner, put the ambulance in drive. There was no time to think, only time to react. As the ambulance began to pull forward, I lunged through the pass-through space between the patient compartment and the cab of the ambulance. I was in an outstretched position on my knees. I grabbed the gearshift with my right hand and shoved it into park. It made the most God-awful grinding noise. The ambulance came to a stop and the guy punched me in the left side of my face. I remember thinking “man…he hit like a girl”. Wanting to stop the threat, while in a kneeling position, I attempted to chop his neck with my left hand. The strike proved worthless because I was kneeling and he was sitting up in a drivers’ seat. He simply raised his shoulder to block the blow. So, I did the next best thing… with his hand over the top of mine on the gearshift, me trying to keep it in park, him trying to pull it down as he floored the accelerator, I placed my left hand in his face. My previous training and experience taught me that a “distraction” keeps a person from being able to focus (which is why RACE2REACT is part of our EVE4EMS/Fire and EVE4HP). I began to yell at the patient’s daughter who was seated in the passenger seat to take the keys from the ignition. It was obvious her fear had frozen her. Instead of reaching to turn off the ignition, she began to pray out loud. Suddenly the passenger side door opened. It was my partner. I yelled to him to take the keys from the ignition. He started to climb over the daughter …then went to the other side. Once he opened the driver’s door, he turned off the ignition. I was still pushing the guys face as a distraction when I yelled to my partner “jerk this mother-f***er out-a here!”. My partner grabbed the guy by his feet and pulled. I watched as the guy bounced off the floor then off of the running board. I went out the door after him. I remember being so angry. 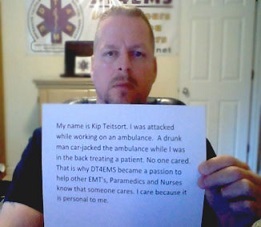 I was a full-time police officer working part time on the ambulance…I never, ever wanted to injure/hurt/beat up anyone. But this guy… Wow, the feeling of anger was so much I had an overwhelming urge to hurt him. I stepped forward toward him and just before I did something stupid… “Force Options/Continuum” went flashing through my head. I knew if I struck him I would now be the aggressor. When the officer arrived and took custody I told him the story. I later found out the guy was charged with DWI and simple assault. I was enraged because I could only imagine what would have happened if that would have occurred while I was in a PD uniform. Heck, cops would offer to bus in other officers to make sure they guy had the book thrown at him. But not in medicine, we see assaults as “part of the job”. Not only would have officers and the courts treated him differently, but it would have made the national news. In contrast, the car-jacking of an ambulance was not considered real news. It was on like page 7 of a local newspaper. I recall having to act like it didn’t bother me. Like I was supposed to handle it. There was no real support offered from administration or peers. Again, like it was just supposed to be that way. It wasn’t until years later I really talked about my incident to others because I was embarrassed that it happened to me. You see, only then did I realize DT4EMS (later called EVE) had to be more than a class, it had to be a culture change. It was then I decided to take this “hobby” of DT4EMS and make it a passion. Now I get to travel the country and listen to the anecdotal stories of EMS/Fire and nursing staff as they tell their personal stories (many too ashamed to share them in public, so they ask to speak to me on a break, away from others) of how they have been attacked. Many of their stories make mine seem like a walk in the park. It is their stories and the way they tell them, with emotion in their voices and written all over their body language, that show there is a problem with the culture. 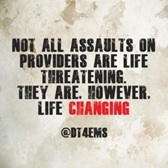 That not every assault is life threatening, but they are all life changing. If you think about it… were we not “dispatched” to the guy in the ditch? So by cultural definition, did that not make him a “patient”? I was a full-time police officer working part-time on an ambulance. I almost always had a gun on me. I did not have one one me on the ambulance that day. If I had, is kidnapping a time when a person can “reasonably” use lethal force to defend himself or others? If I would been armed that day and shot the man, would the headlines read “Off-Duty Police Officer Shoots Kills Car-Jacker of Ambulance” or “Paramedic Shoots Patient in Ambulance”? We may never know the answer, regardless, this is how my hobby became a passion. This video Saving Yours While You Save Others explains what my passion is and how it has literally “infected” others. Viewer beware, it just may change everything you thought about scene safety. “Paramedic Shoots Patient in Ambulance” is not what the news media reported after the ambulance I was working on was car-jacked (while I was in the back with a patient)… but it very well could have been if I would have responded the way so many say they would have here. Stay Saving Yours While You Save Others!